You are very welcome to make your comments on bonitin's Brazilian Bugs in this thread. Wow Myriam, you were so privileged to have those beautiful birds visit your display! Of course the food was a draw, and you were very clever to make the setting for them. 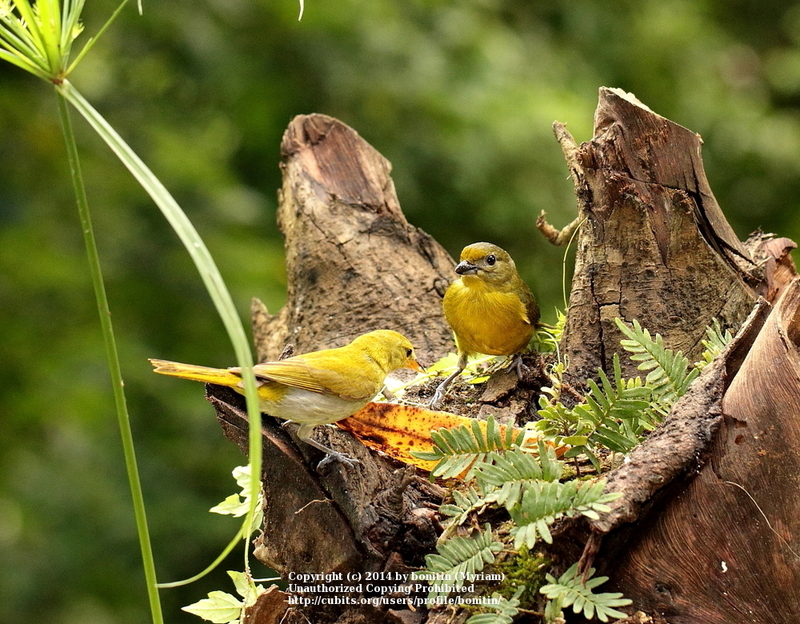 I see one bird has a mouthful of nesting material, with a young bird looking on! They don't waste any time do they. I love all the shots, I had to pick out a couple which really caught my eye ..
You're right they don't waste any time, I noticed that a couple could have babies in different stages of development, like teenagers and toddlers! A couple of times I saw that the male was feeding his partner, maybe that was part of a court shipping ritual! 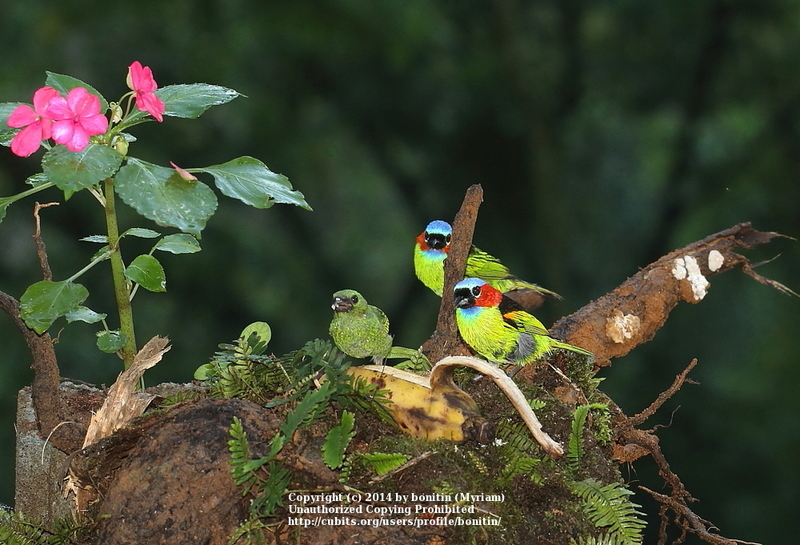 Apart from their colourful outfit, they reminded me very much of my sparrows in behaviour and even sounds! Blackbirds start another nest as soon as the young are out the nest too Myriam, when I had a family coming for cat food the male took over the duty of feeding 5 babies, The female left him to look after them after about two days, poor guy struggled but he did his duty well. 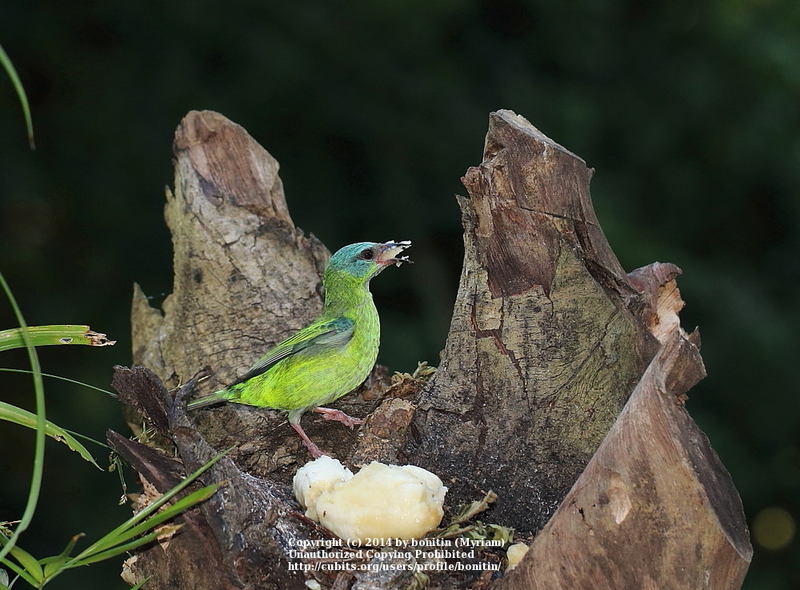 Feeding the partner could be to show the male is capable of providing, Wood Pigeons do that too but the male also shares the nest sitting. I can imagine the cacophony of bird sounds in the jungle! 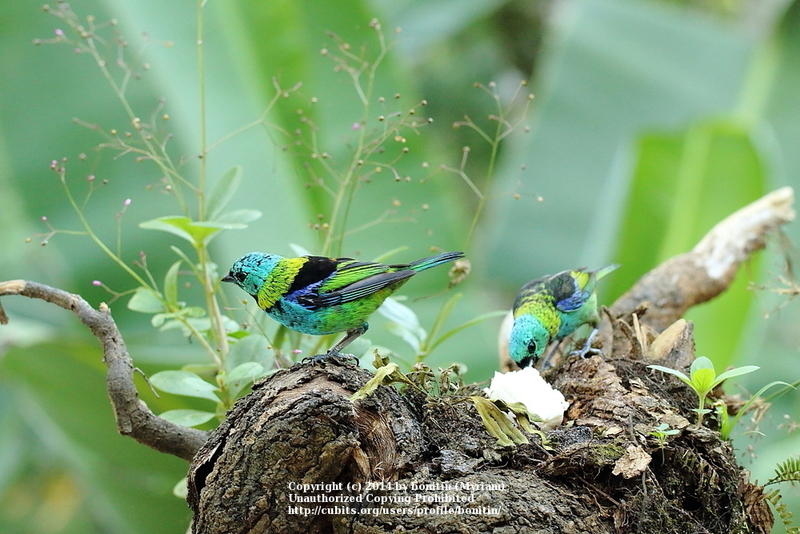 The Sayaca Tanager is not a brightly coloured as the Green-headed Tanager but the subtle grey blends well with the blue, nice series again Myriam! 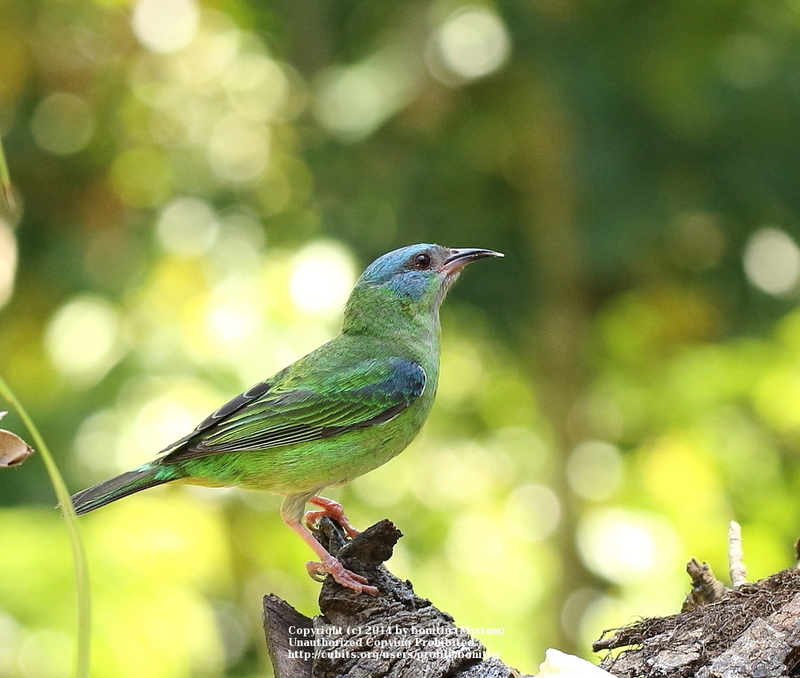 The Green-headed Tanagers with it look like immature birds? 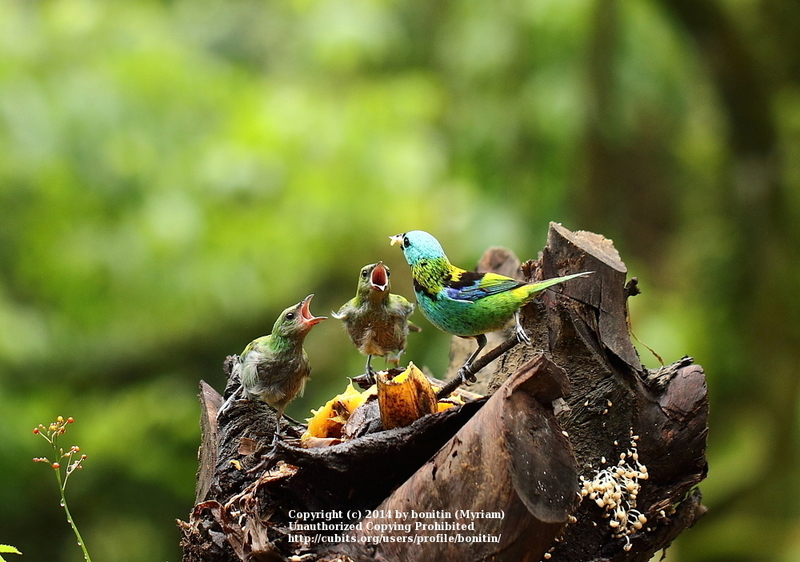 Thanks Janet, yes the Green-headed Tanagers were juvenile ones, they got along very well, not minding to share the food. It does has more subtle colours but very angelic looking! 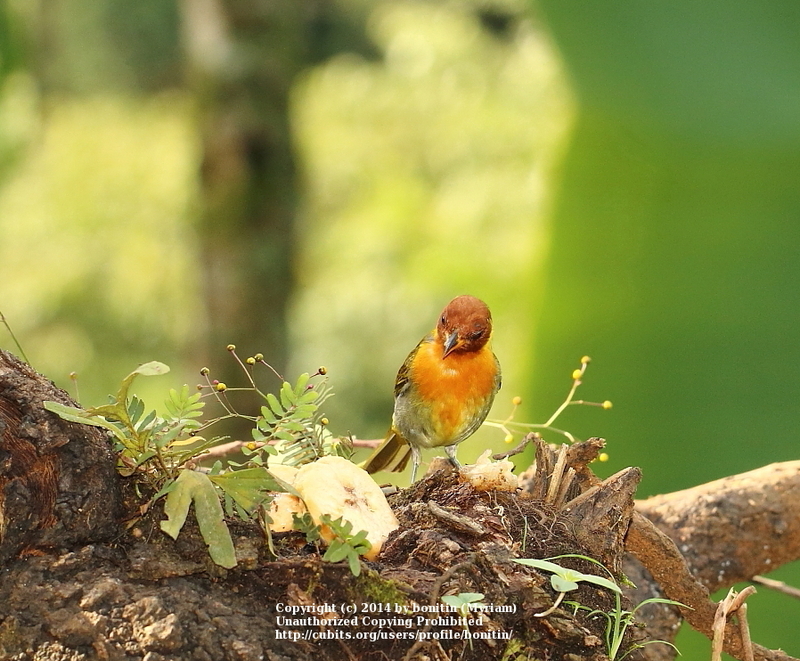 The chestnut headed bird is a Rufous-headed Tanager Myriam! Lovely shots! This one has a quizzical expression, very nice shot ..
Of course that is the male, the paler one will be the female. I'm not sure about this one with the colour above the beak, could it be an immature male? I found a 'sub adult' male ..
Look at the index of that site, it should be useful! Thanks Janet! 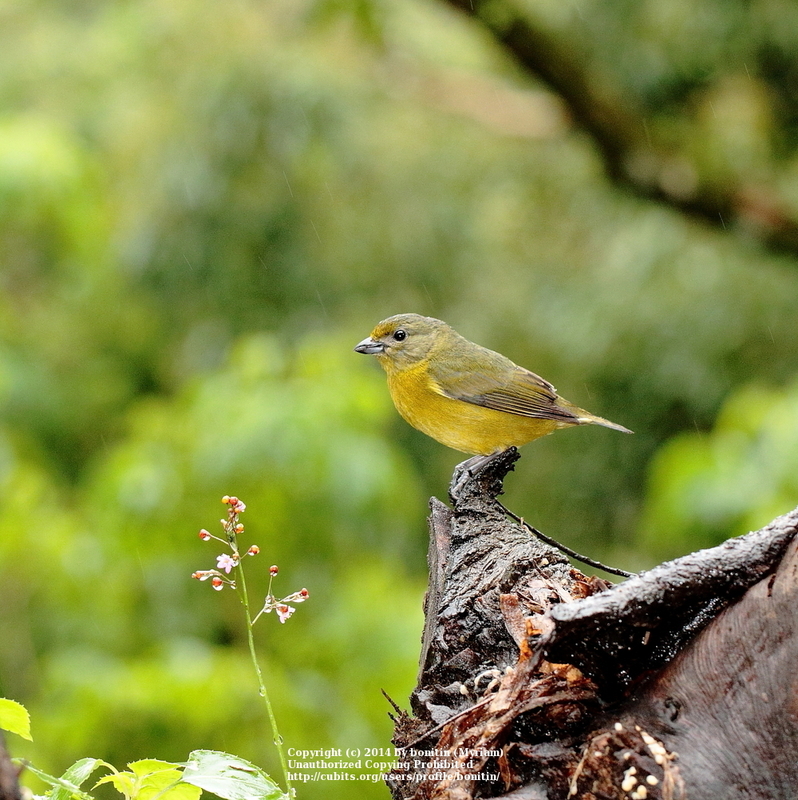 It definitely is the Rufous-headed Tanager (Hemithraupis ruficapilla) ! I was lucky to get photos of it as according to the last link you gave it tends to forage on the upper canopy, and that was exactly the advantage of the location of the house on the steep hill! 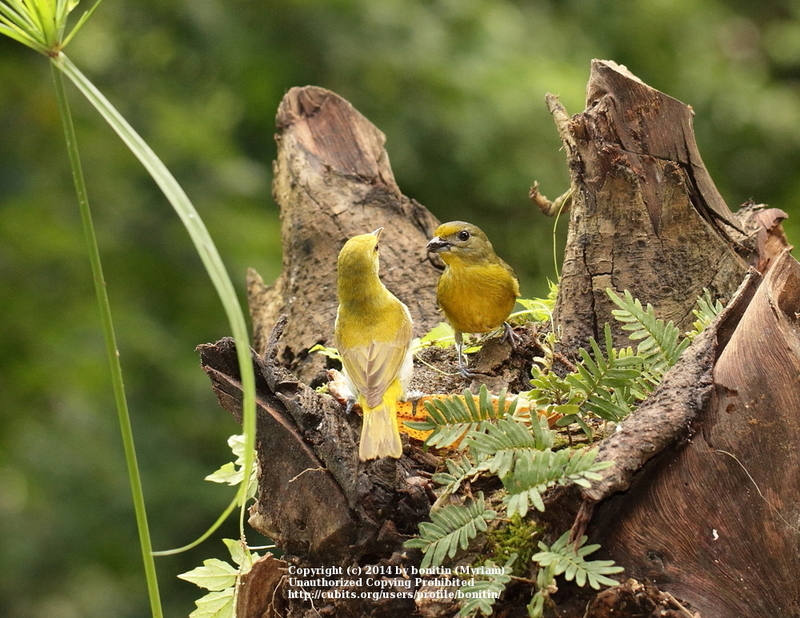 I think the baby could be a sub adult male it was the same bird like in this picture of the mom with baby. Thanks too for that Index, it might be useful indeed! Lucky for you Myriam with all that rain! Do you know what the large fruit is, with the male looking shocked that he might have to eat all that fruit? Yes, there were many days with rain, and then we were 'stuck' to the house, that's why the birds were a great subject to photograph, they didn't seem to mind the rain at all! The very large fruit is a Jaca Janet! I liked the fruit, very nourishing, but it is quite some work to get the edible parts around the large seeds from the tough fibrous tissue holding it all together.. The large seeds are edible too when roasted in a fire and delicious in home made bread like Geraldo, Paula's partner treated us with it! There were a lot of those trees all around, and it was the peak season of them carrying fruit. That one we just found dropped under one of those trees which was loaded of them. It was really amazing to what size they could grow! I see the difficulty in separating the flesh of the Jaca fruit Myriam! The bread sounds interesting, and the fact a man made it is also interesting! 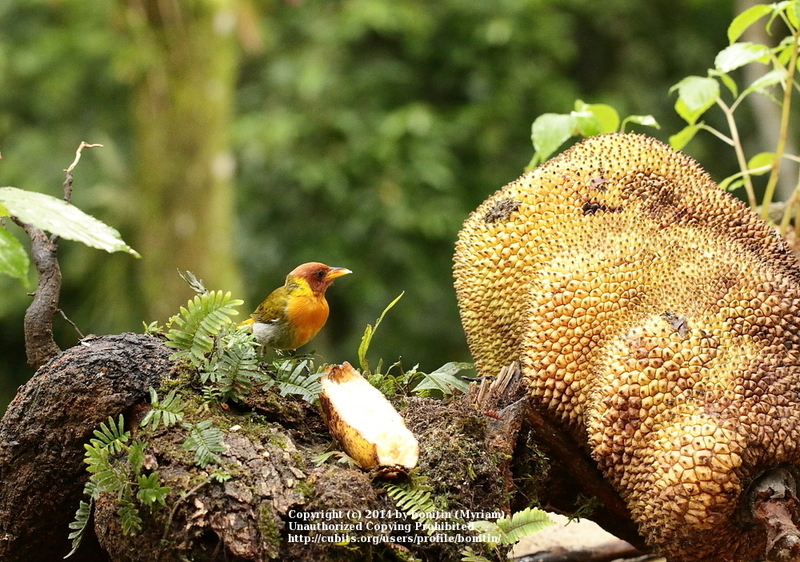 It's difficult to imagine so many fruit bearing trees, no wonder there's lots in colourful birds in the forests, a true paradise! You got some great shots of Lucy the owl! Was it the circular led lights which you attached to the camera lens that you used Myriam? I loved your account of how you first heard the owl, also your description of her movements and how she flew brought her to life in my mind. A cat with wings, yes I can visualise that. Thanks Janet, Geraldo, who is an excellent and original art photographer has once been a professional baker! No, I actually couldn't use the circular led lights on my new macro lens, as when I bought it from ebay I still had my other lens that got defect afterwards! I could still mount it on the camera itself but that didn't seem to work so well, the light not falling in the right spot for close-by insects, it wouldn't have been strong enough for photographing Lucy in the distance. But I used it for photographing insects at night anyway holding it by one hand. I had bought a more powerful box type too that could be mounted on a tripod or just placed on a solid surface whatever suited the moment. Now I'm really jealous Myriam, such a lot of colourful birds! I googled images of Violaceous euphonia, the one I wasn't sure about looks like a female Violaceous euphonia or at least an immature one! 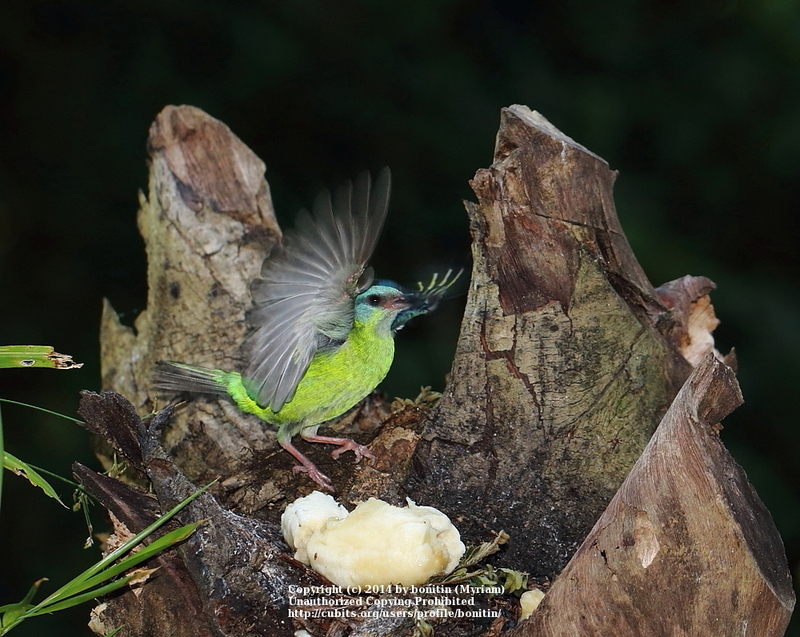 The Turquoise Honeycreeper is a very inquisitive looking bird, the male must have been feeding young in a hole to wear his throat feathers off! 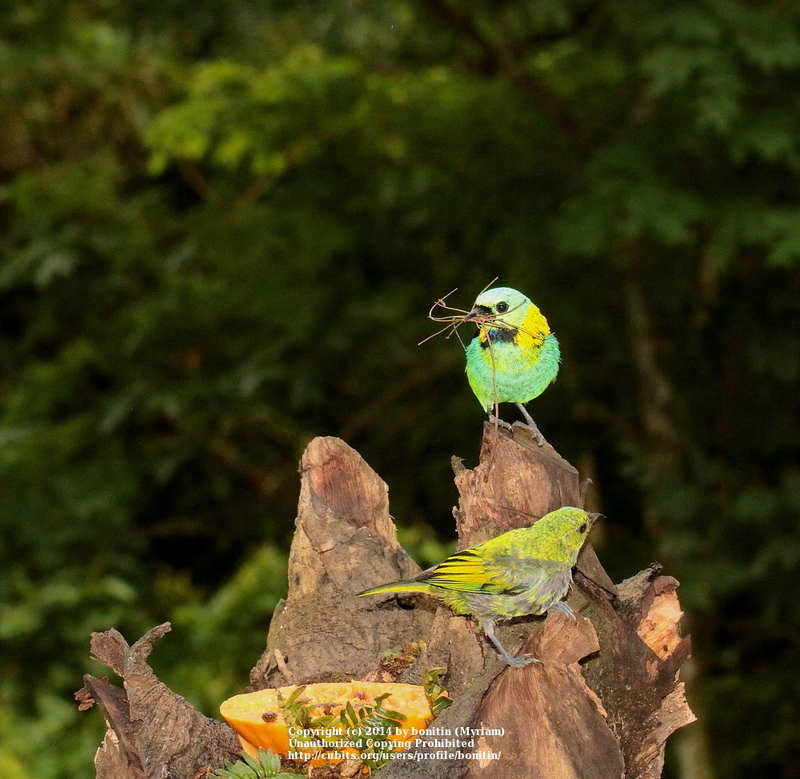 I love these shots ..
Wow wow wow, the Red-neckted Tanager is a spectacular bird! They were all watching you. All shots are fantastic, it's difficult to pick out one but this one captures all three with worried expressions, and the Impatiens deserves a mention too! 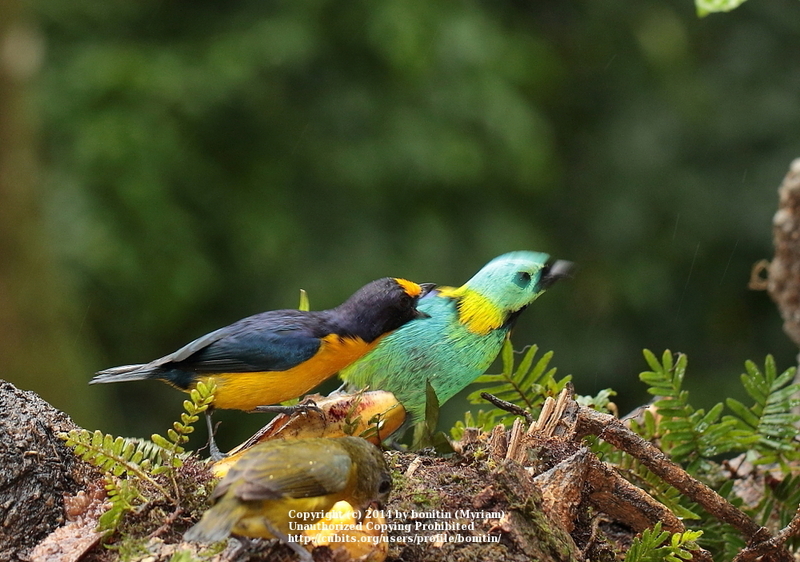 What a cute but brassy bird Violaceous Euphonia is! Spectacular shots again! Not so cute when chasing off the intruder! It looks like a Green-headed Tanager. 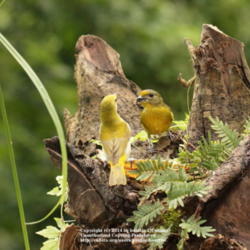 I thought it was the same bird like in these pictures with what I thought was the mom! But I found out they were taken on a different day, so probably not the same bird..
Maybe I should move it to the Violaceous euphonia post and put a remark that it probably is a female or an immature Euphonia? I know you have a sharp eye! Forgot to say that I found an excellent site for ID of birds of all over the world, I managed to get the ID of all the hummingbirds I managed to photograph, and some others too! It is so nice because they do have an index with names, but when you click on one, it brings you to a page with all the different family members in very good photos, saves a lot of time! That's a very good site Myriam! I had found a world bird site once before but don't have it now. Where you have both birds in the same shot you could put the photos in both Myriam, the only reason I thought it could be immature was some females appear to have some darker colouring on the back and legs but that might be a seasonal thing. The bird does look mature.